A man was allegedly deported from Belgium this week ‘because he wasn’t gay enough’. 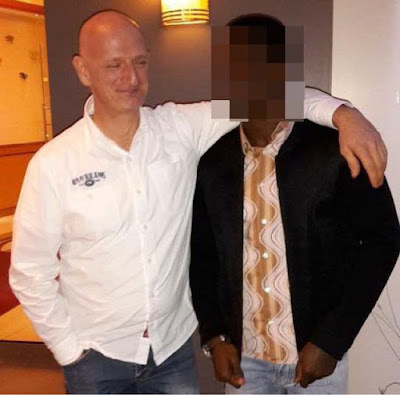 Boyfriend Jurgen Hendrickx issued a public plea for help on Wednesday after Festus was sent to Ghana – where homosexuality is illegal. The pair, who met on a dating app in Antwerp in 2015, have been in a relationship for two years. However Mr Hendrickx said ‘immigration in Belgium didn’t want to believe he was gay’ and ‘refused to let him stay despite being given evidence’. Speaking to Metro.co.uk, he said that he and Festus had handed over dozens of pictures as well as evidence that Festus had been with other men before they met. He said: ‘We have appeal so many times, we have done everything. ‘Immigration in Belgium don’t want to believe he is gay. They say he is not gay enough. ‘I have spoken to him today, he is very scared, he has nobody there. I want to go to him. ‘Over the last two years our relationship has grown and grown and grown, it is so good. ‘I have autism and it’s not easy for me to find love but I have. ‘I can’t stop crying, being gay is illegal in Ghana and I fear they are going to kill him. In Ghana, residents face up to three years in prison if convicted of being gay. Mr Hendrickx now hope to travel to Ghana next week to reunite with his partner. ‘Last year I was in hospital and he sat with me for eight hours a day from 2pm to 10pm just so we could be together. Metro.co.uk has contacted immigration in Belgium for comment.